SharePoint Dev Ecosystem / SharePoint Patterns and Practices (PnP) December 2018 update is out with a summary of the latest guidance, samples, and solutions from SharePoint engineering or from the community for the community. This article is a summary of all the different areas and topics around SharePoint Dev ecosystem during the past month. Most viewed articles in the SharePoint Dev documentation during November 2018. 16th of November – MVP Article – How I joined the PnP Core Team? 7th of November – MVP Article – PnP SPFx Yeoman generator v1.4.0 – Angular Elements support is here! SharePoint Dev community has 3 different recurrent community calls, which you can choose to participate based on your interest and availability. All calls are recorded and published in the SharePoint Dev YouTube channel typically within the following 24 hours after the call. If you are interested in doing a live demo of your solution or sample in these calls, please do reach out to the PnP Core Team members (contacts later in this post). These are great opportunities to gain visibility for example for existing MVPs or for community members who would like to be MVPs in the future. New sample react-adaptive-cards-image-gallery demonstrates the capability of using Adaptive Cards with SharePoint Framework. New sample react-command-mail-view-as-image list view command set extension that emails the current view to selected (external or internal user) and also saves the same image in SharePoint. SharePoint Dev articles are surfaced at docs.microsoft.com/en-us/sharepoint/dev. 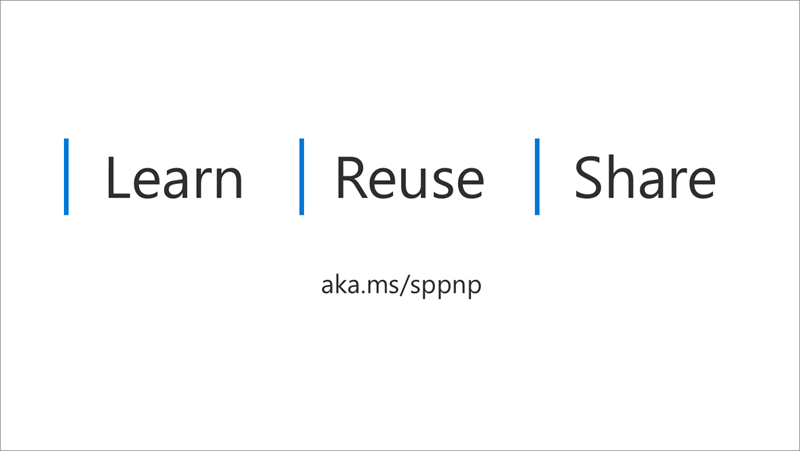 ´Since the last release, we have now merged also SharePoint PnP Solution guidance to docs.microsoft.com platform, so you’ll only have one location to follow all relevant SharePoint Dev documentation and guidance. You can provide contributions to these documents by submitting documentation improvements using GitHub tooling. All of the SharePoint Dev docs are stored and surfaced from the sp-dev-docs repository. You can find all SharePoint Dev videos on our YouTube Channel at http://aka.ms/spdev-videos. This location contains already a significant amount of detailed training material, demo videos, and community call recordings. There were no new guidance videos during this month on top of the webcast recordings, webcasts, and weekly summary videos. December 2018 monthly community call is on Tuesday 11th of December at 8 AM PST / 5 PM CEST / 4 PM GMT for latest release details with demos – Download recurrent invite to monthly community call with a detailed schedule for your time zone from http://aka.ms/sppnp-call.